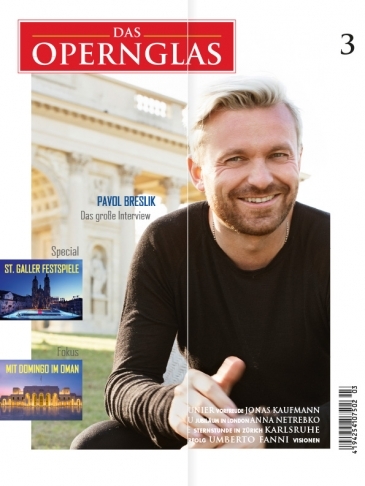 The overnight success of the tenor Pavol Breslik began in 2005, when he was chosen the “Most Promising Singer of the Year” in a critics’ survey in the magazine “Opernwelt”. Born in 1979 in Slovakia, he completed his studies at the Academy of Arts in Banska Bystrica. In 2000 he won the first prize at the Antonín-Dvořák Competition in the Czech Republic. In 2002/03, he continued his education at the Opera Studio CNIPAL in Marseilles, and completed master classes with Yvonne Minton, Mady Mesplé, Mirella Freni and William Matteuzzi. From 2003 to 2006, Pavol Breslik was a member of the Berlin State Opera Unter den Linden, where among other parts he was heard as Ferrando (“Così fan tutte”), Tamino (“Zauberflöte”), Don Ottavio (“Don Giovanni”), Nemorino (“Elisir d’amore”), Kudrjasch (“Katja Kabanowa”) and God’s Fool (“Boris Godunov”). During this time, he gave guest performances with his Mozart parts at the Teatro Verdi in Trieste, at the Piccolo Teatro in Milan, at Théâtre de la Monnaie in Brussels, at the Glyndebourne Festival, at the Wiener Festwochen and at the Aix-en-Provence Festival. At the Paris Théâtre du Châtelet, he performed Jaquino in “Fidelio“. As a free-lance performer since 2006, he has expanded his Mozart repertoire with Belmonte (“Entführung aus dem Serail”) and Idamante (“Idomeneo”). As Don Ottavio he performed at the Salzburg Festival and at the Metropolitan Opera New York, as Alfred (“Die Fledermaus”) at the Geneva Grand Théâtre, as Tamino in London’s Covent Garden, as the Evangelist in the Johannes Passion in Théâtre du Châtelet, as Idamante, Lenski (“Eugen Onegin”) and Edgardo (“Lucia di Lammermoor”), Tamino, Idamante, Cassio, Rinuccio and Henry Morosus (“The silent women”) at the Bavarian State Opera Munich and the Royal Opera House Covent Garden, Silvio (“Arbore di Diana” by Martín y Soler) in Madrid, Macduff at the Deutsche Oper Berlin. In Munich he sang with Edita Gruberova, giving his début performance as Gennaro in Christof Loy’s successful new production of Donizetti’s “Lucrezia Borgia”. With the Berlin Philharmonic Orchestra under Simon Rattle he sang Narraboth (“Salome”) in Berlin and Salzburg. At Zurich Opera Stewa (“Jenufa”). In Zurich, he gave his debut as Faust, Nadir (“Pêcheurs de Perles”) and Peter Quint in „Turn of the Screw“. At Paris Opéra he sung Tamino with enormous success. In 2017 he took part in the opening ceremony of the Elbphilharmonie under the baton of Thomas Hengelbrock. Pavol Breslik is also a welcome guest on the concert stage. At the BBC Proms in London, he performed with the Philharmonic Orchestra under Kurt Masur in Janáček’s “Glagolitic Mass”, with the Concert d’Astrée under Emmanuelle Haïm in London and in Paris in Handel’s “Il trionfo del tempo” (on Virgin Classics CD), at the Edinburgh Festival in Beethoven’s C Major Mass and in “Christus am Ölberg”. Under Kurt Masur he also performed in the premiere of Siegfried Matthus’ “Te Deum“, and with the Orchestre National de France, in Beethoven’s “Missa Solemnis” and the Ninth Symphony. Further, he performed the “Missa Solemnis” with the London Symphony Orchestra under Colin Davis, “La Messe Solennelle” and “Roméo et Juliette“ by Berlioz with the Orchestra of the Bavarian Radio under Riccardo Muti. The original version of Dvořák’s “Stabat Mater” was recorded on CD by Naïve with the Ensemble Accentus as well as the “Missa solemnis” with Enoch zu Guttenberg. He was also performing “Don Giovanni” with Los Angeles Philharmonic Orchestra under Gustavo Dudamel. And most recently he made his debut with the Boston Symphony Orchestra at the Tanglewood Festival with Rossini’s Stabat Mater. In 2018 his future plans include a.o. his debut as Hans (“The bartered bride”) at the Munich State Opera, his debut as Leicester (“Maria Stuarda”) in Zurich, Alfredo (“Traviata”) at the Vienna State Opera and the Deutsche Oper Berlin, Ottavio (“Don Giovanni”) at Covent Garden and Romeo (“Roméo et Julitette”) in Hobart/Tasmania.